The Department of Homeland Security has canceled Temporary Protective Status for Haitians, giving recipients until July 22, 2019, to leave the country. As conditions on the ground have changed, D.H.S. senior officials say the law dictated that the protective status be removed. The department grants T.P.S. to individuals whose home countries are suffering from ongoing conflict, environmental disasters or other unsafe conditions and protects them from deportation. More than 50,000 Haitians are in the United States with T.P.S. D.H.S. has canceled Temporary Protective Status for Haitians, giving recipients until July 22, 2019, to leave the country. “We’re extremely concerned about what’s going to happen to these individuals and their families,” says Ashley Feasley, director of migration policy and public affairs at the U.S. Conference of Catholic Bishops. She says Haitian T.P.S. recipients have 27,000 U.S. citizen children. A large number of T.P.S. recipients are employed, have mortgages and participate in the community. “They have worked to comply with the existing regulations, and they have been vetted by the Department of Homeland Security,” Ms. Feasley says. 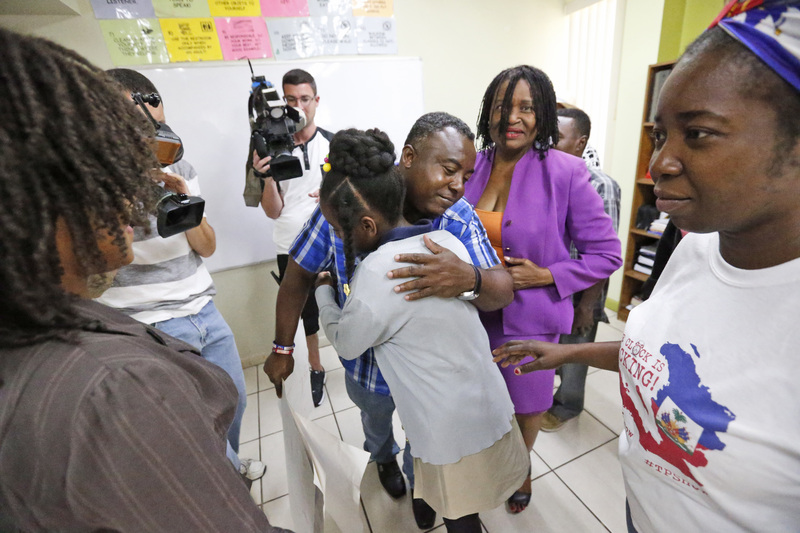 More than 50,000 Haitians are in the United States with T.P.S. The protected status had been due to expire last July when John Kelly, then-Homeland Security secretary, extended it through Jan. 22, 2018. Since then, hurricanes Irma and Maria have flooded Haitian towns and destroyed farms, according to the Center for Migration Studies. In 2016, Hurricane Matthew killed more than 800 and destroyed 300,000 homes, and the nation has been reeling from a cholera outbreak since 2010, the year a 7.0-magnitude earthquake rocked Haiti. Last week, Ms. Duke received a letter from Bishop Joe S. Vásquez of Austin, Tex., chairman of the U.S. Conference of Catholic Bishops’ committee on migration, Catholic Legal Immigration Network, Inc., Catholic Relief Services and Catholic Charities USA urging an 18-month extension. The nation has been reeling from a cholera outbreak since 2010, the year a 7.0-magnitude earthquake rocked Haiti. “[I]t would be premature and detrimental to the country’s redevelopment to return T.P.S. holders to Haiti,” according to the letter, which shared insights from a recent delegation to Haiti led by Archbishop Thomas G. Wenski of Miami. The delegation found that the country is still recovering from the 2010 earthquake and subsequent natural disasters which have exacerbated efforts to rebuild the poorest nation in the Western Hemisphere. According to the conference, Haiti cannot handle a return of the 50,000 Haitians who have T.P.S. Officials say Haitians should look for alternatives to change their immigration status, such as applying for residency if they are married to a U.S. citizen. If no such avenue is available, they should prepare to move back to Haiti, D.H.S. says. Many would have to do so with U.S. citizen children. “Congress can and should act on this issue,” Ms. Feasley says, noting that the U.S. bishops are urging legislators to enact measures addressed to T.P.S. recipients that have been in the country for years. While T.P.S. was first granted to Haitians in 2010, some have been in the country for more than 10 years, she says. Haitians with the protected status need to reapply for employment authorization documents to legally work in the United States through July 22, 2019. More T.P.S. information will be available in a Federal Register notice. That this government which loves to congratulate the citizens and repeat to the world the self serving meme that "Americans are the most compassionate , decent , good people the world has ever known", would now deport Haitians who come from the poorest nation in the hemisphere and one of the poorest on earth, after that horrific earth quake we all witnessed the aftermath of, is one of the most callous, cruel, inhumane policies this country has ever implemented. Where is the outcry? Is it that their native language is French but not Spanish [Latinos have clout now; politically and culturally] or that they are of African descent? "What the hell is goin on"? That this can happen to some of the truly most desperate and needy and defenseless people on the planet, our neighbors no less, is mindboggling in its inhumanity and glaring antithesis of what we profess our values to be. Appalling!